There are not many things you can simply bolt on your Corvette that will add instant horsepower, particularly items that require no other modifications. A free-flowing exhaust system happens to be one of those things; and in this case, the install can be done in your garage. Corvette Central has a bolt-on system for big- and small-block powered Corvettes, and the aluminized finish will keep the metal looking like new for years. Aluminizing provides excellent protection against rust and corrosion. This system is a four-speed, 2-1/2-inch aluminized LT-1 setup, but it can be ordered for any non-LT-1 small-block. The increased diameter of the tubing provides a more efficient exit for spent gases and the mandrel bent tubes fit the undercarriage perfectly. We are removing incorrect, and very restrictive, 2-inch pipes and a set of aftermarket turbo style mufflers, which were getting noisy due to small rust holes in the casing. 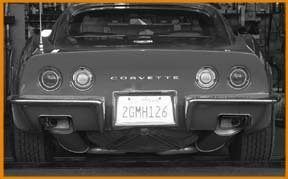 The Corvette Central mufflers have the correct look and sound for a restored Corvette and tuck nicely up under the car. We immediately noticed a better exhaust tone, and the acceleration through the gears was noticeably improved. Better gas mileage can also result from this installation, depending on how much lead is in your right shoe. The system consists of the left and right exhaust pipes with mufflers attached (part numbers 323331 and 323332) and the left and right front pipes from the exhaust manifolds (part numbers 322532 and 323607). These pipes have a reduction fitting pre-welded on to mate exactly to the smaller diameter exhaust manifolds on this rebuilt 270-horse, 350 cid engine. Two new muffler hangers for 1968-'72 (part number 323289 for the pair) and the installation hardware kit (part number 0132046) complete the necessary parts. The overall part number for this Hi-Performance exhaust system is 323708. A new 2-1/2-inch center exhaust hanger bracket, which mounts at the transmission mount on the cross member, is available under part number 322186. We modified our original small diameter hanger to work with the larger diameter pipes; but if you're going to do the installation at home, order the new center hanger with your system. As we mentioned earlier, this system is well engineered and no modifications are necessary to the pipes or mufflers for a nice fit. 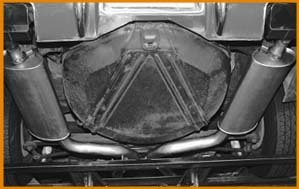 You must work at getting the mufflers and pipes tucked up tightly to the chassis for a sanitary look from the back of the car. We've all seen the typical muffler shop installation with both pipes almost dragging on the pavement or one pipe higher or lower than the other. After a little adjustment of the pipe angles, the Corvette Central system will fit perfectly. Since we couldn't pop the shutter and install the system simultaneously, Jeff Henry of Championship Muffler in Simi Valley, California did the installation. After a thorough inspection, Jeff considered the exhaust system first rate and was impressed with the ease of installation, fit and finish. Everything is installed and secured. You must strive for a symmetrical fit. Notice the spacing between the spare tire carrier and each muffler and how tight the two pipes hug the chassis in front of the carrier. With a little patience, your system will look the same. Contact the folks at CCentral when your Corvette is ready for a few more horses and a great looking and sounding exhaust system.